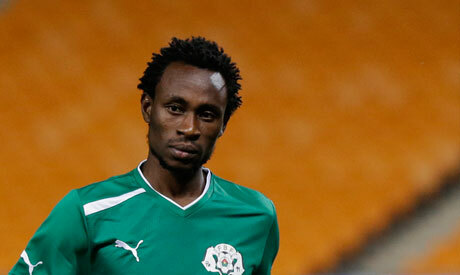 Burkina Faso's talisman Jonathan Pitroipa has been named best player of the 2013 Africa Cup of Nations. However, it was champions Nigeria who got the lion's share tonight as Emmanuel Emenike won the Golden Boot after scoring four goals and Victor Moses scooped the Fair player Award. Coach Stephen Keshi also matched the record of late Egyptian manager Mahmoud El-Gohary, who was the only man to win the tournament as a player and coach. The goal of Tunisia's Youssef Msakni against Algeria in the first round was voted best goal of the tournament. Pitroipa inspired Burkina Faso to a memorable place in the Nations Cup final with a series of impressive displays, bamboozling opponents with his catchy feints and speedy runs. He scored in the 4-0 drubbing of Ethiopia in Group C and also netted the decisive goal which gave Burkina a narrow 1-0 victory over Togo in the quarter-finals. Pitroipa was on the receiving end of a highly-controversial refereeing decision when he was sent off by Tunisian referee Slim Jdidi after he was given a second yellow card for alleged simulation in the semi-final win over Ghana. However, after Jdidi admitted he was wrong to give Pitroipa his marching orders, the 26-year-old had his dismissal rescinded by the Confederation of African Football (CAF) to play in the final. Pitroipa made his name in the Bundesliga with Freiburg and Hamburg before joining French side Stade Rennes in the summer of 2011. Vincent Enyeama (Nigeria) - Efe Ambrose (Nigeria), Bakary Kone (Burkina Faso), Nando (Cape Verde) Siaka Tiene (Ivory Coast) - John Obi Mikel (Nigeria), Jonathan Pitroipa (Burkina Faso), Seydou Keita (Mali) - Asamoah Gyan (Ghana), Emmanuel Emenike (Nigeria), Victor Moses (Nigeria).